I love phone cases, I think they're such a great way to really personalise and decorate your phone with. It allows you to add more personality to your phone and it also makes them look real pretty, depending on the case you opt for. So when GoCustomized got a hold of me and asked me if I would like to review one of their personalised phone cases, I jumped at the opportunity. I thought that in this post I would share with you my views on the order process and the final product itself, I hope you enjoy this review! Navigating myself over the website was real easy in my opinion. There were lots of different options, such as what type of phone case you wanted and what model of phone you had. It was very easy to get myself around the site as well which was a plus as it's always a pain when it's hard to navigate yourself around a site. 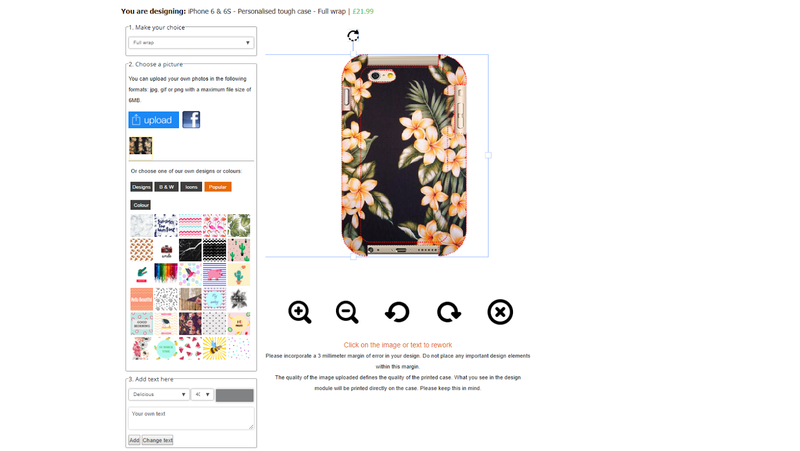 Once you have decided what phone case you wanted (and there were so many different options that I was really impressed by) you get taken to the editing page, where you can personalise your phone case. There were many different phone background/theme options that were all really lovely, I was very tempted to choose one but I ended up designing my own background for my phone case. I guess the only negative thing I have to say with the editing process is the text option, I struggled with adding my own text when I first tried it out however after messing about with different fonts and shades, I managed to add the text I wanted and I was happy with the outcome. The editing process is very straight forward which I think is great as it prevents it from being difficult and confusing to use, so I definitely approve overall! The payment process was also very straight forward, giving you the option of paying through your card or PayPal. So again, overall it was a very easy process to order their product. When I opened up my GoCustomized package I was really happy with what I found. My first initial thoughts were that it was very high quality and looked real glossy - which I loved. As you can see, I chose a Hawaiian theme pattern as the main backgroud and I also chose to add a quote onto the case too. The quote I added was 'There's just no telling, how far I'll go' which is a quote from Moana (if you don't know me, I'm a MASSIVE fan of Moana and so I just had to add a little quote onto my case, making it real personal). I really do love how this phone case looks and the quality is brilliant too. I decided to opt for the tough case in the iPhone 6 case section. This case comes with a rubber bumper that goes in between the phone and outer case shell. I love this case it provides protection towards my phone which is especially great for me when I'm at my scout camp doing activities (preventing it from any unwanted damage). The case fits real snug on my phone which I think is great as it prevents the phone from looking really clunky and bulky which is sometimes the case when you get protective cases for your phone. Overall, I'm really happy with my brand new phone case, I have been using it for over a week and it hasn't faded or broken. The colours are really bright and glossy and I can't wait to pair this phone case up with different outfits in the near future. I also can't wait to include this phone case in some of the flat lay photos I take for my bookstagram. Not only does GoCustomized provide personalised phone cases you can also personalise other items such as speakers, notebooks and power banks. I would 100% recommend using this site if you are looking for an easy phone case site where you can personalise them. Check their website out here. I hope you enjoyed this little post, do you love phone cases as much as I do? ** This post is a collaboration with GoCustomized. GoCustomized were lovely enough to send me one of their products in return of an honest review.